Blog | Is It Time to Replace Pulleys? Is It Time to Replace Pulleys? It's natural to expect that some garage door parts will be affected by the condition of other adjacent components. After all, don't forget that the complex garage systems rely on the good cooperation among different parts. The garage door opener activates motion and as the spring lifts the door along with cables, the rollers move on the tracks in order to open fully the panel. If the pulleys are worn, damaged or split due to missing rivets, the cables will become loose and will scrape against other components. The mechanism will be noisy and the door won't open or will be jammed. Usually pulleys are three or four inches and there are four pulleys for every extension spring garage door system. Since all four of them are used equivalently every time the door is operated, it's good to replace them together. 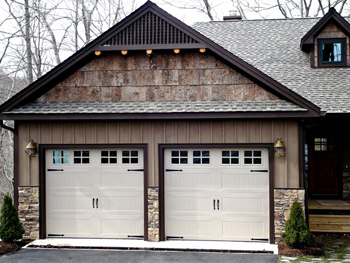 The specialists of Garage Door Repair Saratoga Springs always disconnect the opener before engaging in such tasks and keeping the door open during the replacement is also important. The opener must be disengaged from the door and this is possible by disengaging the garage door trolleybut one must be aware that if the pulleys are worn, the door might not open or won't open evenly. It's important to avoid putting force when trying to open the door or you will do damage. You need to hold on to the top section of the door as you are opening the door, so that it won't come in contact with the worn pulley. The door can be kept open with the help of a ladder or broom stick. With the garage door raised the extension springs will be sufficiently loose so that the garage door cable clip will be easily removed from the s-hook. This way, the cable can be removed from the pulley and then the bolts and nuts holding the pulley in place must be removed, too. Now it's time to put the bolt in the new pulley, put it back to the garage door track and tighten it with the nut. This is the basic idea of how to remove an old, damaged pulley and swap it with a new one but never forget that these engagements need attention and often require professional assistance.